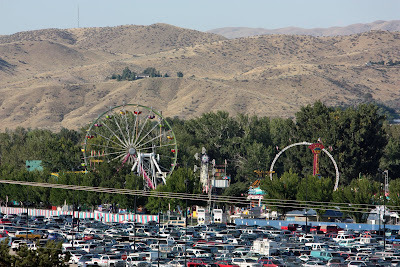 The Western Idaho Fair is underway, and with school starting Monday and temperatures hovering around 100 degrees, we haven't made a visit yet. This is an agricultural event, as well as a carnival, a foodie event, home arts competition, and musical entertainment venue. I hope to post some close-up pictures this weekend, along with new foods to share on the "Eat Boise" blog - see the link on the right hand side of this page. The fair looks very well attended, judging by all of those cars. I like the graduated fields you have here: parking lot, green fairgrounds, scrubbed hills. That's a great idea to post a general view. I agree with Brattcat's analysis of the photo. Chinese troops in Caves! Obama's not American! Death Panels! The Sky is Falling! Send some of that hot weather over to Iowa! It has been COLD out here. They are talking about frost warnings already!! I have sweet corn and tomatoes still getting ripe! The fair looks fun and I enjoyed several of your previous posts!